Just steps from the main Bryce Resort Lodge, this premium level cabin offers a rustic feel with breathtaking views and modern accommodations. The new designer kitchen boasts granite countertops, under cabinet lighting, slow-close cabinetry, stone covered bar, high-end stainless steel appliances including a refrigerator, range, dishwasher, microwave, and farm sink. The large private octagonal deck offers a mountain panorama with views of the ski mountain during the winter months and fireworks from the resort during the summer. The stone fireplace has a mounted 60” Samsung LED smart TV that allows guests to use wifi to easily access a range of apps including Netflix, Amazon and more because cable tv is unavailable. 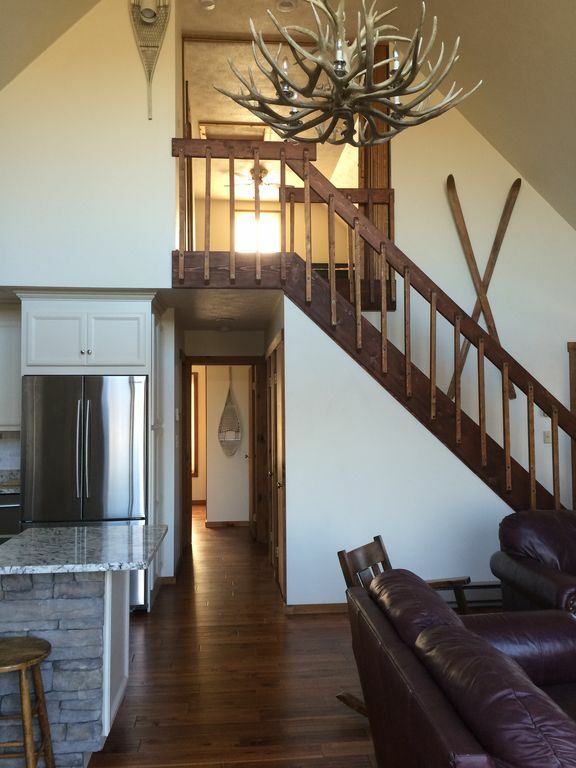 The Master Loft has its own Private Deck and Full Bathroom. Other amenities include: Individually Zoned Climate Heating, Hand Scrapped Hardwood Floors throughout the entire home, Stainless Steel Gas Grill, A mix of Adirondack style and Custom Barn Wood Furniture (Dining room table seats 6+ and bar seats 4), Outdoor Fire Pit with provided firewood, Large Deer Antler Chandelier, Premium Shower Heads, Washer and Dryer, 3" Memory Foam Bed Toppers, High quality linens, quilts, pillows, and throws. A short walk will take guests to the first tee of the Golf Course, the Ski Lifts, or the Recreation Area which offers a Pro Shop, Mini Golf, Tennis, Hiking, Rock Climbing, Zip Lining, Euro Bungee, Summer and Winter Tubing Hill, Mountain Biking Trails, Swimming Pool, Private Airport, and Basketball Courts. The Copper Kettle Bar & Lounge at the main lodge offers food and drinks 7 nights a week. Events at Bryce Resort are year-round and include: Craft Shows, Wine Festivals, Fireworks, Tough Mudders, Bike Bonanzas, Runs, Races, Dinners, and Cook-offs. Lake Laura is just 1 mile away and offers: Fishing, Swimming, Paddle Boating, Kayaking, Beach Front, and Hiking Trails. Centrally located to more than 7 different wineries and vineyards including: Shenandoah, Cave Ridge, Wolf Gap, Kindred Pointe, Muse, Wisteria, and Cedar Creek. Easy day trips in all directions include: Multiple Cavern Tours, Museums, War Memorials, National Parks, The Shenandoah River (Fly Fishing, Rafting, and Tubing), The Blue Ridge Mountains, Historic Sites, Orchards, Farms, Antique Shops, Shenandoah Music Festival Grounds, Harrisonburg, and James Madison University. Washington D.C. is just a quick 2 hour drive away so whether your looking for a fun-filled adventure or just a relaxing weekend away from the hustle and bustle, this property will enable you to truly customize your vacation. My husband and I purchased this home as a home away from home for our growing family. Every time we come out here, we automatically feel a sense of calm. The beauty of Bryce immediately relieves any stress you have and allows you to focus on family time and relaxation. We hope you will enjoy it as much as we do! We chose this property because it is so close to the resort, we could walk there in 5 minutes or take a 1 minute drive. The home has a huge deck which allows us to overlook the mountain and spend time outside enjoying the nature. We've had many get togethers with friends and family, always enjoying the scenery and company around us. When we first bought the house, it was in it's original condition from the 1980's. We gutted the entire house and started from the ground up, making it the perfect cabin that we would want to visit if we were on vacation. We head out to Bryce at least once a month to relax and unplug, and hope you will chose our home and do the same! Bryce Resort is a 4-season resort, most known for skiing, golfing, mountain biking, and Lake Laura. Surrounding farms, farm animals, antique malls, flea markets, streams, fields, barns, trails, etc. Community tennis located at Bryce Resort. Call the golf shop to reserve a time frame. The Mills did an amazing job making us feel right at home. If something was out of place the took care of it immediately. We will be coming back for sure. This place was an awesome setting for a guys weekend. Grill, fire pit, and a great set-up for some group games. We had a great stay at Jennifer’s cabin. Beautiful home, awesome views, and super convenient to the resort. We had a couple questions while we were there and Jennifer was very responsive. Would definitely stay here again! Beautiful home in a beautiful location. Very accomodating. All you have to bring is clothes and food. Everything else is there waiting for you. My only complaint is there was no cable TV, which was not mentioned under the details of the property. However, there is a smart TV with Netflix and Hulu. Jennifer was also very prompt to answer any inquiries we had. I would definitely recommend this property to others. It was a perfect trip for my friends and I to unwind from school & to take a break! The Mills Family home was the perfect place for my friends to enjoy a fantastic week together! From a great view for the back patio to the wonderful resort down the street, it was a beautiful home to spend with my friends for our time spent there! We stayed over for a long weekend during Presidents’ Day. The house had everything we needed, Comfy beds, clean bathrooms, fully stacked kitchen, and an overall great environment. Communication with Jennifer was so easy! We loved our stay. Bonus points: a welcome bottle of wine upon arrival. What a nice surprise! Thank you Jennifer and we hope to come back again soon! Early Check-In and Late Check outs are available upon request in accordance with booking. Typical Check-In is 3:00pm and Check Out is 12:00pm. Please let me know if you need a different time for check-in or check-out so I can plan accordingly. Linens/Towels and Cleaning charges are included in cleaning fee.